How exciting! Since this is the beginning of the semester and since I recently graduated from seminary, I decided to write this with you in mind to provide you with some advice. This is only a small sampling of tips. Friends. Find them. Find a few people with whom you can share your whole life story and listen to theirs. Start developing your friendship base the first few weeks. These friends will encourage you and walk beside you throughout your journey. You will encounter seasons that are trying on your faith, and you will need those close friends to remind you of your anchor, who is Christ. From day one, people will ask about your post-graduation plans. I’m not kidding. You’ll hear that the first week, all throughout seminary, the semester in which you will graduate, and obviously the day you graduate. No pressure, right? Exactly. There is no need to feel any pressure. You will experience this question, but there is no rush to have everything figured out, even the day after you graduate. You say, “But, I’m not graduating yet, so how does this apply to me?” It applies to you, because you will undoubtly go through seasons (possibly your first semester) that tempt you to think that you must have everything figured out in order to move forward that semester. However, this is a common temptation, but it is a lie. You just have to take the next step. Take. Your. Time. Don’t rush through seminary, p-lease. It might take you an extra year, or seven, to finish your degree. No need to worry. Many students expand their program an extra year. 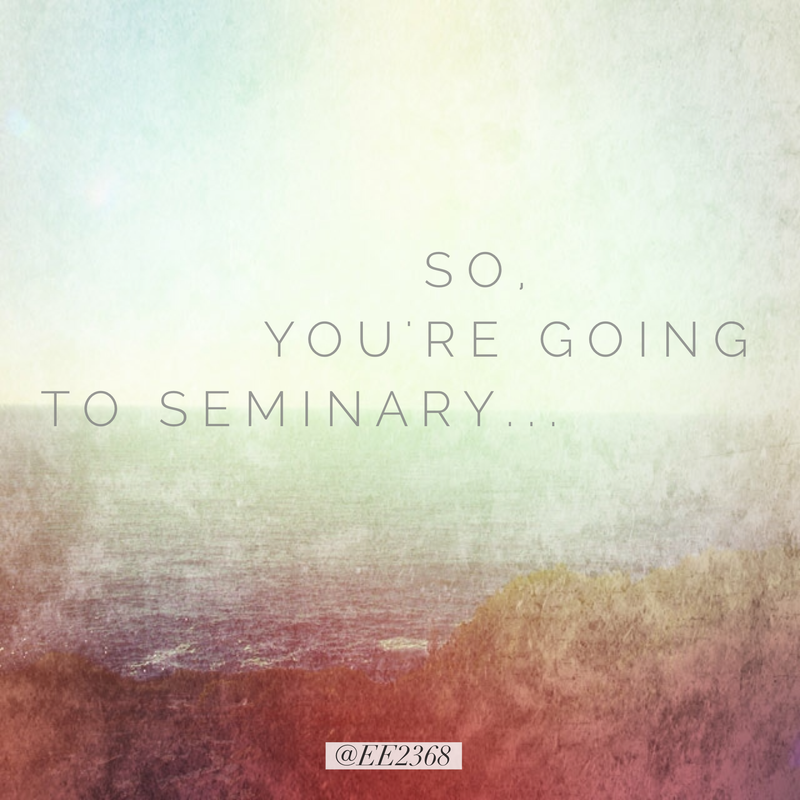 Ask yourself, “What do I want out of my seminary experience?” Do you just want a job? I mean, you could have already been working somewhere with your bachelor’s degree. Yep, you definitely need a job after graduation, but goodness gracious, don’t pay thousands of dollars each semester just to sit and wait x number of years to get a job. No, take time to feed your academic curiosity. Read and learn as much as you can. Ask challenging, relevant questions. Please don’t just sit there in class and not ask any questions. Urgh, and don’t be tempted to scroll through Facebook or shop on Amazon the whole time, or at all. Learn how to debate points with which you disagree. When I took a debate course in college, we didn’t get to pick the side that we would represent. The professor randomly assigned sides, and we had to debate the side that was given to us. The point of this course wasn’t to regurgitate the same information that we already knew about a given topic. Rather, the point was to learn how to craft a sound, logical argument and back it up with clear, concise research. If you really want to engage people who disagree with you, then it will take more than emotional babble to carry on the conversation. You need to learn how to present a sound argument. Please don’t be the person who asks weird questions in class that have nothing to do with what the professor is talking about. We’re not paying all this money just to sit and listen to you boast about your nuanced understanding of a given subject. That’s great that you have such an understanding about it. Maybe be a little more humble about it? Be bold enough to see past surface-level differences between you and other classmates. You may not understand another person’s culture, but don’t let that stop you from developing friendships with people who are different than you. Do fun stuff. (Those are technical words, by the way.) “Fun stuff” is a real serious seminary term that many students have trouble understanding. They hide behind their tall, Jenga-style stacks of books and their scattered piles of synthetic charts, and they can’t seem to find a way out of their mazes of Greek sentence diagrams. However, this serious term called “fun stuff” refers to those activities that are waiting to be discovered just beyond those stacks, piles, and mazes. What are such activities? I’m not going to tell you. Part of the fun is discovering those fun adventures with your God-given friends. Please know that you have many people who are praying for you. Don’t discount this. You’re starting an amazing journey. Keep your eyes open, and don’t miss all that God will show you along your journey. *You may experience seasons in which you have no idea how you will pay for your next meal. Please note that in Point 3, I am not telling you to stop praying for provision or to stop having faith. You need to ask for these things daily. What I am saying is that God provides for people in different ways, and His form of provision for you will look different than the next person’s. Let God provide for you, accept the ways in which He provides for you, and don’t let anyone make you feel bad for accepting such provision. It’s not their journey. It’s between you and God.